By George D. Newton, Jr.
George D. Newton, Jr. is a native of Geneseo, New York, small town of 2,500 in western New York State. He was raised there along with two older brothers and a younger sister. George excelled in high school academics and continued his education at Harvard College, having earned a Harvard Club of Rochester scholarship. George had early exposure to the law through his father, who graduated from Harvard Law School and maintained a practice in Geneseo for many years; his father was also elected County Judge and thereafter served six years as Justice of the Supreme Court of New York (statewide trials). George’s paternal grandfather was a successful trial lawyer in western New York and became a State Senator in 1914. He also served as Attorney General of New York State from 1918-1922. While at Harvard College, George gained admission to three law schools: Harvard, Michigan, and Yale. After two years serving in Army Counterintelligence, including a year in Korea, he elected to attend Yale Law School. George graduated in 1958 and joined the Chicago law firm of Kirkland & Ellis. 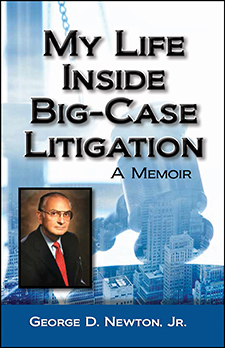 For twenty-seven years he worked on cases defending corporations such as Standard Oil (Indiana), Firestone, General Motors, Westinghouse, and International Harvester. In 1985, George became Deputy General Counsel of Reynolds Tobacco in Winston-Salem, North Carolina. Five months later he helped win two important “smoker cases” in Kentucky and California. Reynolds never lost a case during his tenure. After Reynolds was sold to Kohlberg Kravis and Roberts & Co (KKR), George retired in 1991 and became an Adjunct Professor at Wake Forest Law School, where he taught Complex Civil Litigation for thirteen years.